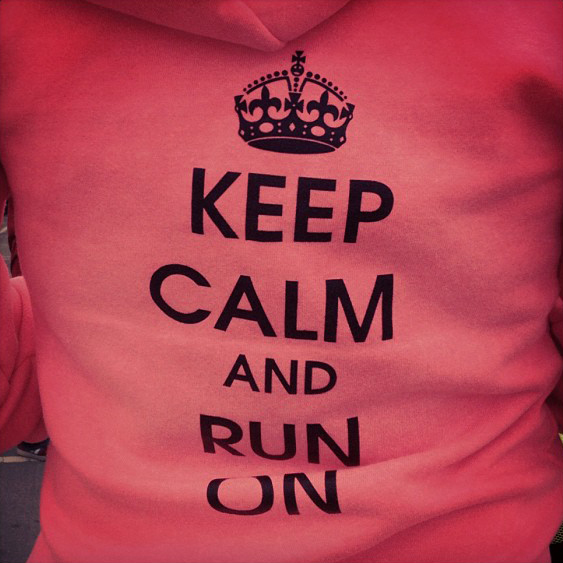 Keep Calm and Run On | Trace B. One evening while working on my Runner’s Booty business plan, KEEP CALM AND RUN ON popped into my head. I don’t know where this idea came from but I must have seen the original KEEP CALM AND CARRY ON poster/slogan somewhere (read about it’s origin here). I thought it was the perfect mantra, not only for me, but for runners everywhere, especially during that push through the wall. In a way, after some time had passed, I had wanted to get rid of this design because this slogan was popping up EVERYWHERE with the copy tweaked here and there (my favorite being KEEP CALM AND EAT A CUPCAKE), but I just couldn’t. It’s perfect (for me). Running’s not easy. Running a marathon is hard. Running an ultra is even crazier. During training and races, we are tested both physically and mentally. We experience things that we could never be prepared for, it doesn’t matter how much we train, it won’t matter that we might have done everything right leading up to that day because…things happen. The only things that will matter when they do are the methods in which we deal with them. KEEP CALM AND RUN ON for me personally, is a reminder that I may not always be in control but I can control how I will deal with these challenges. Stay focused, stay positive, stay calm and most definitely, RUN ON!